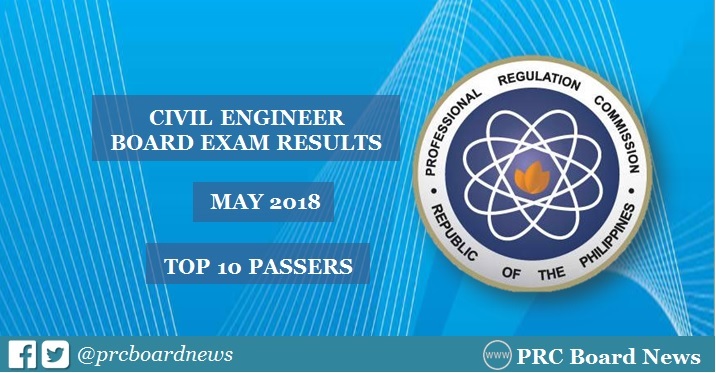 MANILA, Philippines - The May 2018 Civil Engineer (CE) board exam top 10 or topnotchers including other results - list of passers, top performing schools and performance of schools are released online today, May 11, 2018 or in four (4) working days after the last day of exam. Renz Rodney Sarile Fernandez from Western Mindanao State University (WMSU) - Zamboanga City aced the board with 93.55%. It was followed by Garret Patrick Satsatin Baluyot, Mapua Institute of Technology (MIT) - Manila alum with 93.25%. The Professional Regulation Commission (PRC) administered the licensure exam on May 6 and 7 in the cities of Manila, Davao, Pagadian, Zamboanga, Baguio, Cagayan de Oro, Cebu, Iloilo, Legazpi, Lucena, Tacloban and Tuguegarao. In May 2017 exams, Hisham Adiong Sacar from FEU-Institute of Technology garnered the highest place, 94.60%. It was followed by Christian Paul dela Cruz Sanguyo from Mapua Institute of Technology (MIT) having 93.55% grade. In the May 2016 exam, Mapua Institute of Technology (MIT)-Manila alum Luvincci del Rosario Tan aced the board with 93.70-percent grade. Far Eastern University (FEU)-Institute of Technology alumnus Christian Espiritu Baldo ranked second 93.25 percent grade. Tonight na po ba release ng Civil engineer board exam results?